Home Some Of Our Services Air Duct Cleaning What is Air Duct Cleaning? Almost in every house, apartment, business, school, hospital and basically in any structure there's a system of air ducts used to control the air's temperature or to ventilate the whole building and its various rooms by circulating air in a controlled manner. Those systems need to be cleaned on a regular basis in order to maintain acceptable levels of air quality throughout the building. While cleaning the air duct is undoubtedly important, it can sometimes be a bit tricky. Let's see what air duct cleaning is all about. 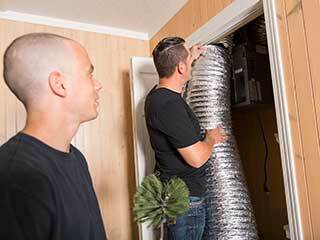 What are Air Ducts Used for? Ductwork, which is the entire system of air ducts coming and going through a building serve several purposes. Duct design, which means planning the layout of all ducts in a structure, usually ensures they reach each and every room and space in a building. This means they can be used to bring air supply to the farthest reaches of a building and to carry out used air that needs to be refreshed, thus having a direct impact on the quality of air within that structure. This also means that they can be used to control the temperature at different parts of a building and carry warm or cold air where needed. Since air ducts travel through the building, sometimes in hard to reach places, they can become blocked with you being none the wiser. Such blocks can occur due to accumulated dust or grit, due to dead rodents, or due to any number of other reasons. However, the problem is, of course, not the block, but its consequences. Blocked ducts can't carry fresh air where it's supposed to get, can't take away air that needs to be refreshed, and can't help in controlling the temperature. Now that it's abundantly clear why air duct cleaning services are so necessary, let's talk a little bit about it. Air duct cleaning means using professional equipment and materials to thoroughly clean all air vents and ducts from accumulated dirt, debris, dead rodents and the like. Using specialized equipment means professionals can get to even less accessible parts of the ventilation system and clean them. A professional cleaning service will result in cleaner air, a ventilation system that works with less strain on it, and better air quality all in all. As you can understand, air quality and indoor ventilation do not always depend solely on the ventilation system but is subject to other influences. Therefore, if you feel as though the air at your home isn't clear as it used to be, call for our experts to check what’s causing it all!